Don’t fear death, it will come when it is ordained. It finds some people even in the most comfortable and safest situations, and it spares others in even the most dangerous accidents. Don’t miss out on life due to the fear of death. Live every day of your life fully undertaking adventures that you remember a lifetime. To prove our point, we have shared the stories of 40 people in this post who have survived incredible near-death experiences. Call it a miracle or call it luck, it just wasn’t their time to go. Scroll on and enjoy the stories peeps. 1 Teetering on the edge. If that car didn’t hit that concrete post, there’s a good chance that it would have been heading way further down into the water. 2 It looks bad enough from this angle. 3 Hope no one was riding shotgun. Obviously, drag racers have a much higher risk when it comes to car accidents than most common folk. Some racers are luckier than others. In one particular race at the Pikes Peak Int’l Raceway, the driver of a Chevy fishtailed and crashed with another car. The 1955 Chevy flipped 360 degrees and the lower half of the driver’s body hung dangerously in front of the windshield. 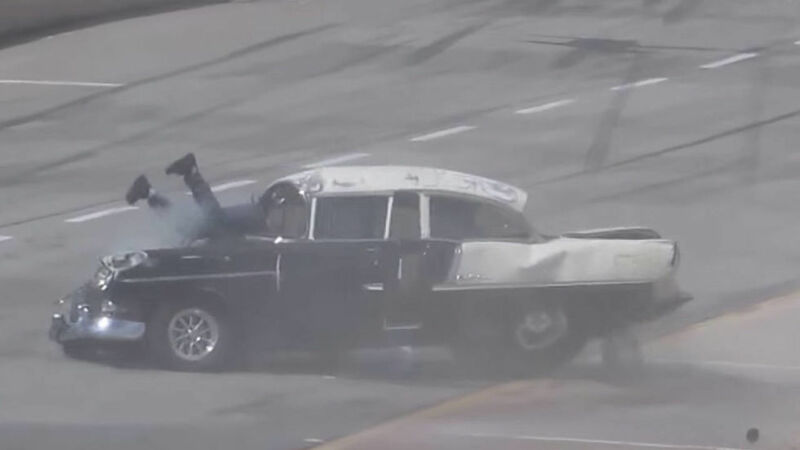 Amazingly, the drag racer walked away alive, except for a few scrapes. This driver from death in this terrible accident was saved by his leg, which was clamped between the truck and the barrier. The guy has gone through a serious shock, but he is already recovering. Another certain individual got sandwiched between two vehicles — this time two massive tractor trailers — and miraculously walked away unscathed. Kaleb Whitby crashed into a truck while driving in Oregon, on a road that was covered in black ice. After the first crash, the thought he was in the clear until another trailer headed straight in front of him. His car got wedged in between, and 20 more cars ended up caught up in the wreck. After everything, he is still alive. Cyclists have higher risks on the road than any other type of driver. No matter how vigilant a cyclist is, you can get into accidents when other drivers are hapless and irresponsible. 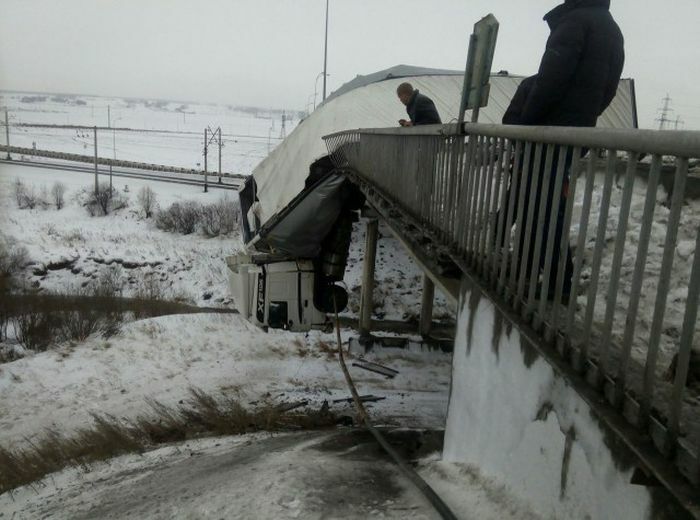 One particular cyclist from Russia got sandwiched between a delivery truck and a car when the two cars crashed in an intersection. We can see in the CCTV cameras how the accident happened — and how fortunate the cyclist was to come out of the crash without a scratch. On a road in Brazil, a collision caused a parked car to rush towards a 56 year old woman and her 5 year old grandson, who were walking on the sidewalk. 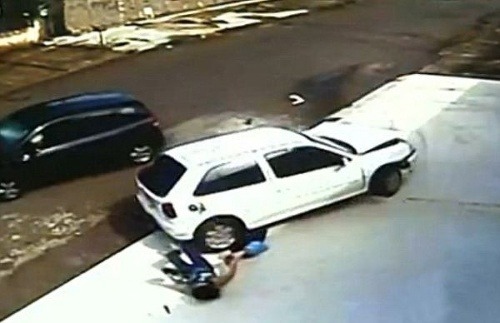 Amazingly, despite being run over by the car, the young boy gets up dazed but unharmed. He immediately comes to his grandma who is lying on the ground. Both are shocked, but they are otherwise fine. So we talked about a few car accidents so far — but how about plane crashes? The latter is a lot more scarier — and seems to seal the fate of the passengers. In May of 2014, a pilot lost control of the plane and crashed into a house in Northglenn, Colorado while flying upside down. He walked away from the debris unharmed. 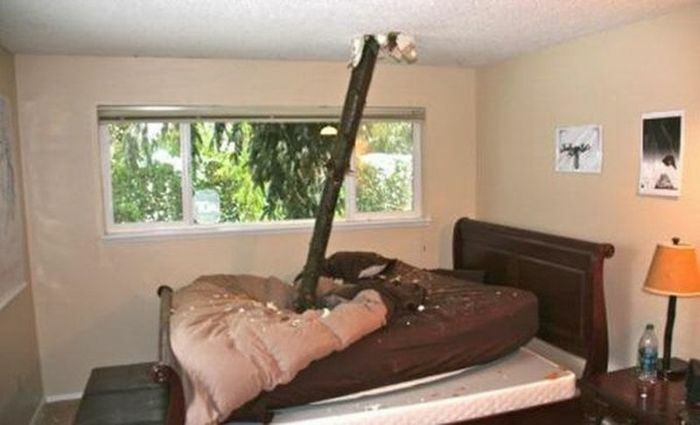 And thankfully, no one was home at the time! This guy was born lucky to survive such an unexpected chase by an elephant. 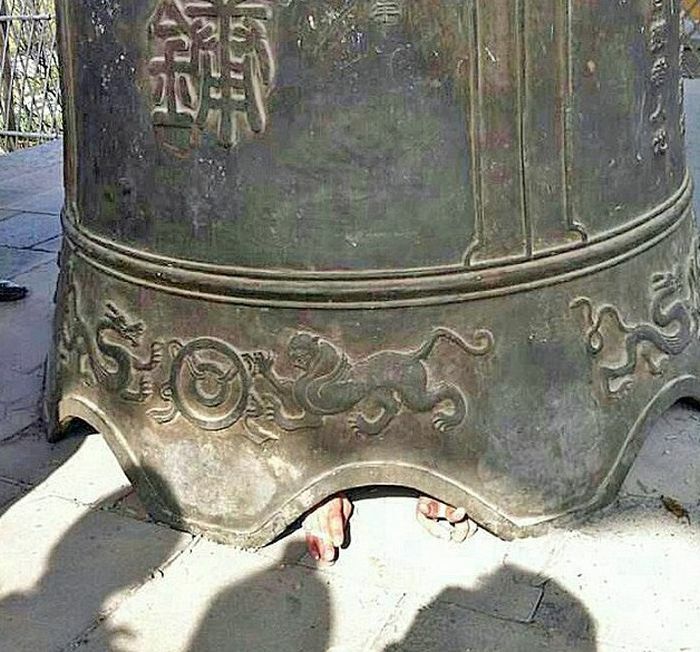 Gigantic feet and huge tusks were after him, but the man managed to escape! It’s just unbelievable! Lightning strikes seem like a rare cause of death, but around 20,000 people are struck every year. 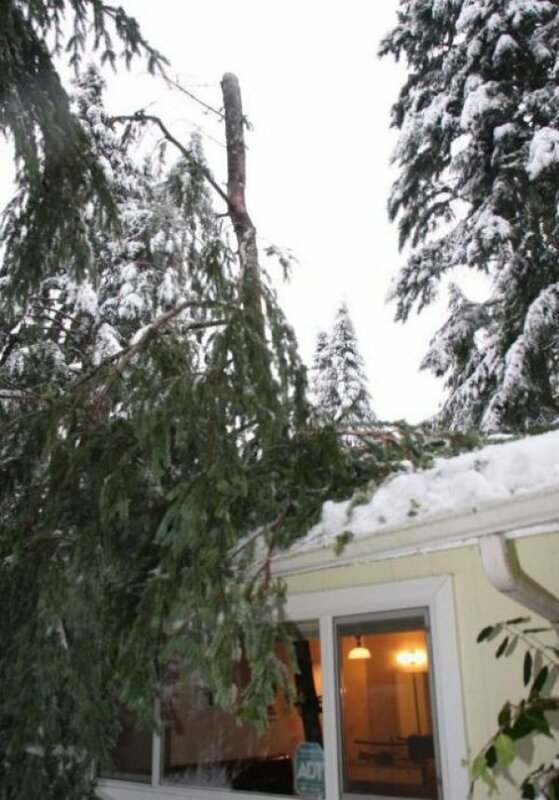 One couple from California, USA were out when they encountered a severe thunderstorm and left stranded. That’s when a lightning struck them, but fortunately survived. They were sent to the hospital where the doctor told them that holding hands helped them save their lives, as it helped diffused the electric current that ran through their bodies. A man visited the Antelope Island State Park, Utah when he became the target of a 1,500 pound North American bison. The animal charged and he got repeatedly rammed into the fence. This might have saved him, because if he had been trampled he would’ve died from internal injuries. He got some bruises but ended up alive and breathing. What happens when a car gets impaled by a big pole? 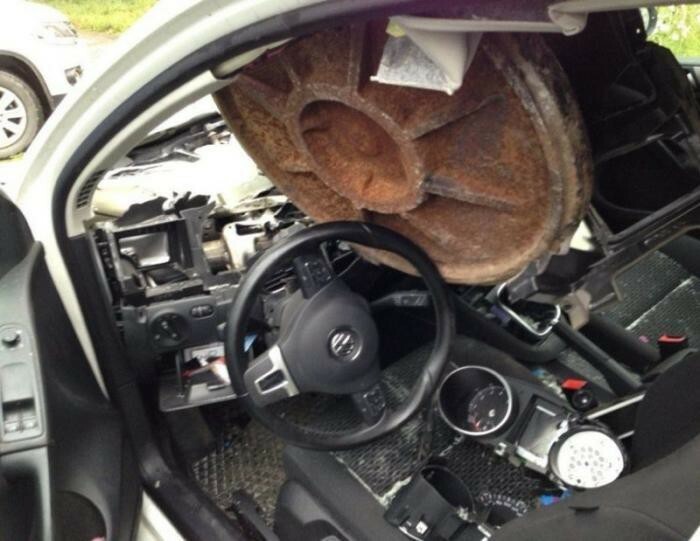 We would definitely assume the worst, but for this driver, he got away pretty scot-free. South African football star Rooi Mahamutsa got into an accident that skewered his BMW like a kebab — but he was able to walk away from the accident completely unharmed! Now he is one lucky guy. A wannabe race car driver got into a near death experienced when he crashed his Lamborghini Gallardo in Thailand and it split in half. Amazingly, the driver walked away safe and sound despite his Lamborghini being cut in half. He is even seen talking on his mobile phone just minutes after the crash. He attributes the miraculous survival to a Buddhist amulet that he wears all the time. Falling off from great heights seem to warrant immediate death, but Timothy Mazurcak fell off a 60 ft. cliff — and managed to survive without a scratch. Timothy was hiking in Letchwork State Park when he lost his footing and slipped off the cliff’s edge. It took authorities two hours to rescue him, but thankfully he wasn’t in grave danger. He was later ticketed for failing to use the park’s designated trails. 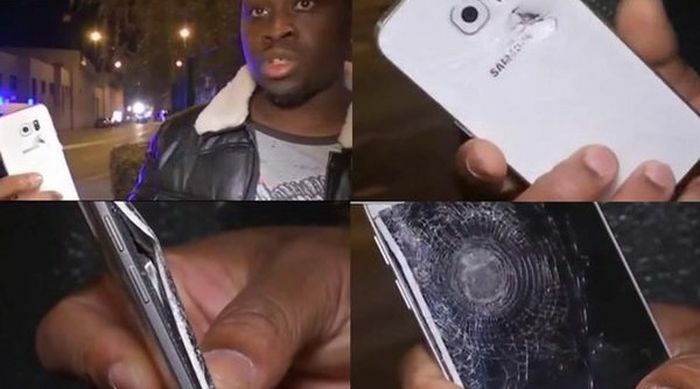 A Brazilian military police officer kept his Lumia 520 in the back pocket that surprisingly saved his life after taking in the bullet that was intended for the 24-year-old police officer, according to a report by Globo.com. On May 1, the police officer, who was off duty at Sao Paulo, arrived at his parents' house to bring his uniform for washing, only to find out that a robber was looting the place and holding his parents and another relative hostage. The robber, who was inside the house, immediately shot a couple of rounds at the police officer, possibly after seeing the latter's police uniform. The accomplice of the robber was said to be on a bike outside the house. Former UK Independence Party Leader, Nigel Farage, 49, exclaimed he was “the luckiest man alive” after surviving a near-fatal airplane crash. While in the plane toting a banner with “UKIP” from behind, the banner became hooked around the tail of the plane. As a result, Farage and his entourage were in for an imminent crash. While calmly waiting for the plane to go down, Farage thought about “life and the world.” After impact, gas was spilled everywhere. Said Farage, “We were trapped inside and there was petrol everywhere. I thought, God, we survived the impact and now we're going to burn to death.” Luckily, that didn't happen. On January 18th, 2014, Steven Gove of Manitowoc, WI was riding his bicycle home after having finished delivering newspapers when he was hit by an allegedly intoxicated 20-year-old man. After righting himself out of the car, Gove was taken to the hospital where he was treated for cuts to the head. Glass was also removed from his eyes. To date, no word has been heard of how the driver didn't realize he had a man stuck in his windshield or why a 56-year-old was delivering newspapers in the first place. A meat packer in Sweden narrowly escaped death after over a half-ton of bacon in a trolley toppled over on top of him. One could say that it wasn't time for him to meat his maker. Okay, no more bad puns, I promise! You can't keep a good Aussie truck driver down! It seemed all hope was lost for truck driver Bill Morgan, who was involved in a horrific truck accident and suffered a fatal heart attack while in the crushed vehicle. After 14 minutes of being clinically dead, Morgan was revived but remained in a coma for 12 days. It was recommended that his family take him off of life support. It's a good thing they didn't because a year later, a fully recovered Morgan proposed to his girlfriend and she said yes. Soon after, he bought a scratch off lottery ticket and won a $17,000 car. Impressed by his win, a Melbourne TV station decided to do a story on him with Morgan re-enacting scratching his lottery ticket. To everyone's amazement, he scratched off another winning ticket worth $170,000 dollars! “I just hope he hasn't used all his good luck up,” said the bride-to-be. They say that the odds of winning the lottery are about the same as getting struck by lightning. 31-year-old Texan Casey Wagner should have bought lottery tickets on this particular day! Seconds later, a second bolt hit Wagner's rodeo clown boot and shot up along his body. “I felt like my thumb was blown off,” he exclaimed. Michael Holmes was one of the top ten skydivers in the world with 7,000 jumps under his belt. This member of the British skydiving team was doing what he thought was another routine jump, 2.2 miles above Lake Taupo in New Zealand, when tragedy struck. As shown in the video recorded by the camera in his helmet, when Homes tugs at the ripcord to release his parachute, nothing happens. Frantically realizing his parachute will not open, the skydiver attempts to release his reserve parachute with no luck. With dying now a very real possibility, Holmes waves goodbye to the world and screams a last message into the microphone of his camera. The video ends with the violent thud of the diver hitting the ground before the camera goes black. You may think that the worst happened, but to his amazement – and ours – Michael Holmes only suffered a punctured lung and a broken ankle from this terrifying fall. Even in the extreme sport of racing, driver Martin Donnelly may be one of the luckiest guys to survive in its history. In 1990, Donnelly was in Spain competing in the Formula One race on the Jerez circuit. In the blink of an eye, his career was over when his Lotus 102 speared off into the barrier at 140 miles an hour. Donnelly was thrown from the vehicle with his seat still strapped to his back. His car was totally obliterated – I mean, completely! Donnelly should not have survived this crash and yet did, but not without suffering any injuries. The racer suffered two broken legs, bruising on his lungs and brain and blood loss. The crash was so violent, it even cracked his crash helmet. After undergoing intensive care and a long recovery, Martin Donnelly now only walks with a slight limp. Thanks to this terrible crash, there has been improved impact protection on F1 cars to ensure future survivors of accidents like his. On July 28, 1945, a B-25 bomber crashed into the then tallest building in the world, the Empire State Building, in New York City. The impact was so hard that the plane made a hole clean through the iconic building. Elevator operator Betty Lou Oliver was standing in the elevator on the 80th floor of the building at the time of the plane's impact, just a floor below. Oliver suffered severe burns and required immediate medical attention. Rescue crews put her right back into the elevator to get her to the hospital as soon as possible, but the cables were so badly damaged they snapped, and sent Betty Lou plummeting 75 floors to the basement of the building. Ms. Oliver defied all odds and survived a second time that day. She still holds a Guinness World Record for the longest survived elevator fall. Just five months later, she returned to her duties as an elevator operator in the very same building. Betty Lou Oliver survived the fall that killed King Kong!